Saturn’s moon, Enceladus, is covered in a thick icy crust, but beneath it might lie an ocean of liquid water despite there are minus 201 degrees Celsius on the surface. This is a theoretical assumption, which is however backed by very solid indirect evidence. Gushing plums of water from the moon’s south pole also point to this conclusion. 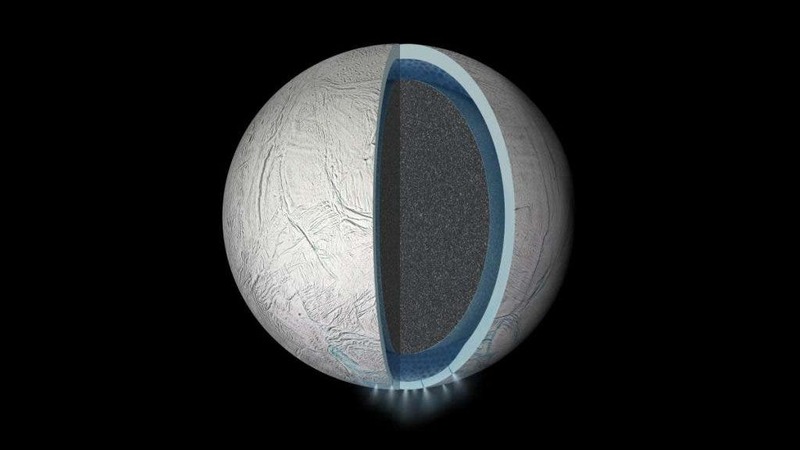 If this is true, Enceladus can be envisioned like a gourmet candy: a hot core (maybe chocolate? ), surrounded by a layer of fluid (water in this case), and all covered in a crunchy crust of ice. Enceladus is the sixth-largest moon of Saturn. It was discovered in 1789 by William Herschel, but very little was known about it until the Voyager fly-bys in the 1980s. We recently learned even more about it thanks to the Cassini spacecraft. We know that it has a type of tectonics, geysers, and there were some indications that it has an ocean under all its ice – 50 km of ice, mind you. As the moon orbits Saturn, it exhibits a distinct wobble or ‘libration’. These wobbles are so tiny and seemingly imperceptible that only high-res images from NASA’s Cassini spacecraft could spot the pattern. Now, researchers at Cornell University have devised a model in which they plugged in all sorts of scenarios to see which of these best fit the pattern. The analysis showed that the only viable scenario was that of a hot core, all surrounded by a global ocean of water. So, what may look like an inhospitable icy wasteland might actually be a lot more friendly. Now… it’s still tough. Imagine Antarctica times 1000 in difficulty, but the prospect of liquid water flowing millions of miles away can get anyone excited. There’s so much that could happen. “If the surface and core were rigidly connected, the core would provide so much dead weight that the wobble would be far smaller than we observe it to be,” said Matthew Tiscareno, who left Cornell in the summer to join the SETI Institute in Mountain View, California. “This proves that there must be a global layer of liquid separating the surface from the core,” he said. Geothermal activity might explain the plumes of water gushing from Enceladus’ poles, but it’s not enough to account for a whole liquid ocean. Instead, the Cornell team suggests that tidal forces exerted by the giant Saturn might be generating enough heat.